Ｊ．Ｎ．Ｃｏｏｐｅｒ　カスタム　８”ファイター60年代　Sold　めずらしいイエローマイカルタ、　↑Ｓ字 ヒルト、　↑そして弱サブヒルトのような? A.G. Russel, formed The Knifemakers Guild. 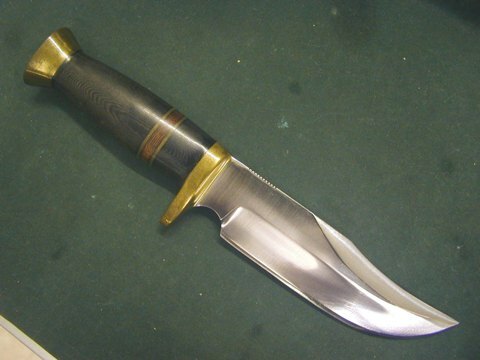 ・Alex Collins, friend of Jody Samson, leaned knife making in Cooper shop. besically made his own style knives. ・Jody Smson. started from Cooper's customer. After work or weekends spent time in Cooper shop. Made 138 knives in Cooper shop, with Cooper methods and supervision. And they have Cooper eagle stamp with "Samson" underneath. Made from June 1975 to April 1976. ・In California, open heart surgery, cut his hand on a band saw. ・Texas Logo: Cooper eagle with TM on the side and CUSTOM underneath. ・Clif Linderman: real estate business man in Southern California during 1970s, Spent a lot of time in Cooper shop. learned how to make " Cooper style knife"
・Making knives and some shipyard work as welder in Virginia Beach . 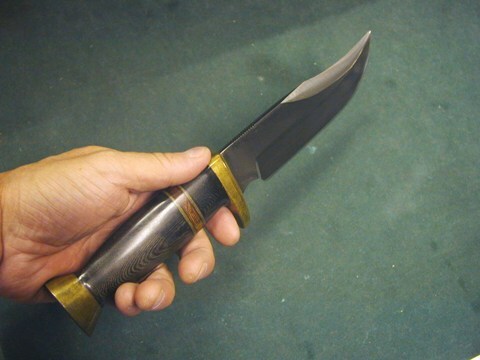 Showed some knives to his Nephew in CA in 1964, and business started. 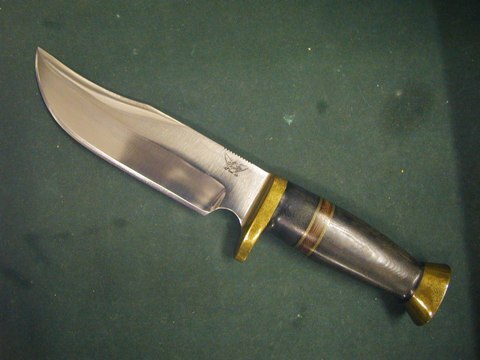 ・75-80% of knives are made in Burbank , CA 1968 to 1978. ・Moved to Lufkin, TX in 1978 with Clif Linderman. 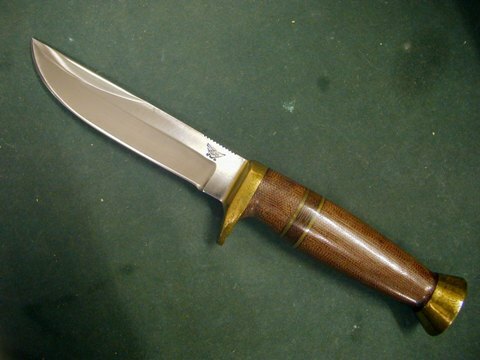 moved to Virginia Beach : made knives and worked as welder in shipyard. ・Early California mark was just : Cooper. Before meeting George, sometimes Cooper did not even stamp his knives. After meeting George, knives are all stamped Cooper. →　Cooper Eagle/TM CUSTOM (Texas logo) used from summer of 1978, before moving to TX. 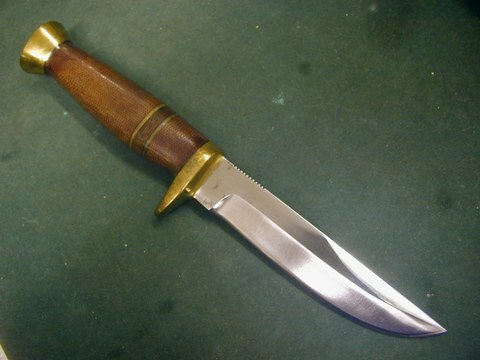 ・Knives are supplied with leather sheath. - 1964 George insisted to use logos on knives. Early CA logo was just : COOPER, First one and half years in CA. - In 1968 George designed the Cooper Eagle. It is used until 1978, when Clif purchased Cooper. From 1975 to 1978 138 knives were made with this LOGO on .